That's really rare - a detached house for two people. Absolutely romantic, surrounded by a small olive grove. 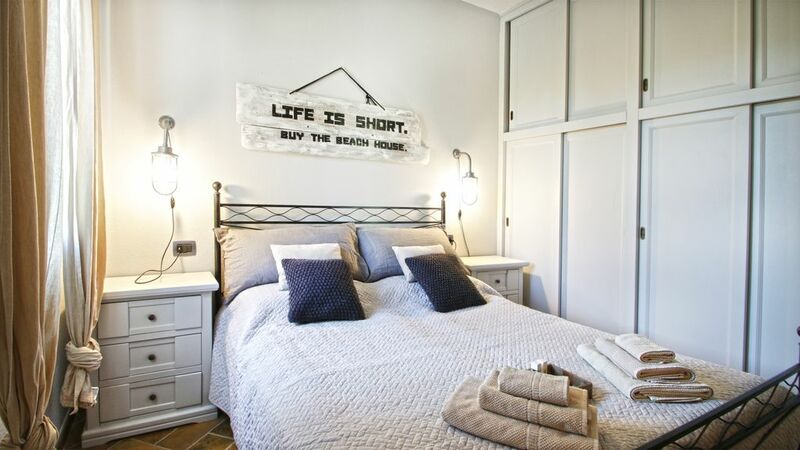 A pretty bedroom with a view of the countryside, beautiful bathroom with window, open kitchen - all lovingly decorated. In the windows you have the whole house grids against the mosquitoes, washing machine and well equipped kitchen leave nothing to be desired. This year was also the porch roof - so you can also dine shady. The location of the house is absolutely great: You are within minutes of the incredibly long beaches of Orosei: located about 1km from the house to the beach Osala, nice bars - but no mass tourism, not comparable to Cala Liberotto. Even in high season you have here incredible amount of space, peace and relaxation. The center of Orosei is also just minutes away. We had an amazing time here! The house is fantastic, well equipped with everything you need. All very comfortable and clean. Unfortunately when we arrived the bikes were not in working order but there are places in town to rent bikes from around 15 euros per day but we actually enjoyed walking as much as possible especially through the pine trees next to the beach along the river, the scenery is stunning! We absolutely loved the garden, so many beautiful butterflies, birds, tree frogs, bats and Golden Eagles flying over. I would recommend the house to any couple that want to get away from it all and chill out in this beautiful part of Sardinia! Thank you Uli for making us feel so welcome! thank you for your review! So happy that you enjoyed our small CASA OSALA and its nature garden...You were so lovely guests. It would be great to host you again! This is a very comfortable house well located a short walk one way to Orisei, and the other to several beaches. The terrace is cool and shaded by olives and fig trees. Airco en 2 fietsen aanwezig maar daar moet je wel voor bijbetalen, staat niet in de beschrijving!! Das Casa Osala ist ein gemütliches kleines Ferienhaus für 2 Personen in mitten eines hübschen (eingezäunten) Olivenhains. Man genießt hier sehr viel Privatsphäre, da die Häuser der Nachbarn relativ weit weg sind. Das Auto kann man auf dem Grundstück, direkt neben dem Haus parken. Drinnen gibt es alles was man braucht. Die Einrichtung ist modern und ansprechend. Das Bett ist sehr bequem (auch bei Rückenleiden zu empfehlen) und die Dusche super (mit einem tollen Wasserdruck!). Einzig das WiFi hat leider überhaupt nicht funktioniert. Es sollte eigentlich jemand wegen der Leitung kommen, kam aber leider nicht. Zu den schönen Stränden sind es jeweils ca. 3 km. Im Juli, als wir da waren, war kaum was los am Strand - das war sehr schön. Im 1km entfernten Ort gibt es jede Menge Supermärkte und Restaurants. Wegen der Hunde der Nachbarn: Wie es scheint, leben die Hunde tagsüber im Zwinger und werden nachts heraus gelassen, wo sie dann mehr oder weniger um die Wette bellen. Da die Häuser aber weiter auseinander liegen, ist das Gebell zwar da aber nicht sehr laut. Uns hat es weniger gestört, bis auf dass uns die Hunde leid taten. Der Email-Kontakt mit Anna Maj war nett. Vor Ort hat uns eine nette Dame begrüsst, die uns alles im und am Haus gezeigt hat. Wir haben hier eine schöne erholsame Woche verbracht und können das Ferienhaus wärmstens empfehlen. Ein gemütliches, gepflegets, schönes Haus in dem es sich gut Urlaub machen lässt. Jederzeit zu empfehlen. Beaches: The bright sandy beaches leave nothing to be desired: sunbathing, swimming, snorkeling, surfing, sailing. These caribbean blue water, a jagged rock or a strong wind - these are the beaches of Golfo di Orosei. You can of course go to the mountains or take great hikes of various difficulty levels, such. As to Cala Gonone. Wild canyons and rugged mountains of Gennargentu are not far away. Also Freeclimber come at their expense. For children, the trips to the caves are interesting: Bue Marino, Grotta di Ispinigoli. Old Town of Orosei: The house above Orosei. Orosei is also alive in the winter and enterprising. You can also buy fresh bread in January, refuel, eat pizza and go to the doctor. Orosei is always real!